Priority Credit Recovery (PCR) has implemented the first phase of our PCR Innovation Project in commercial debt collection. The reface of our web site: http://www.prioritycredit.ca is just the beginning. The PCR Innovation Project combines technology with old fashioned customer service. Our philosophy on customer service is to treat our clients as we would want to be treated ourselves. Peruse our new site and you will begin to see our philosophy in action. For example: You will find a new debtor concept with our Consumer Portal aka Debtor Portal. A new tool so debtors can communicate with collectors. This innovation is ground breaking in our industry so it will be interesting to see how this feature progresses. Security and Innovation go hand in hand. We don’t like filling out unsecured web site forms where the entire Internet can see what we are doing. Neither should we expect our clients or your slow paying customers to have to put up with unsecured communications. Common courtesy and respect dictates that every form on our site is on a secure connection. The PCR Innovation Project doesn’t just stop with new technology. As part of our Innovation Project, we have implemented a dynamic change in client service starting in the trenches with our collectors. After all, who knows better what is happening with your accounts than the actual collector working it? Commercial clients now receive a verbal report or email from the collector within 7 days of listing on any commercial account with a balance over $1000.00. You will also notice on larger balance accounts that our closeout letters and reports contain more details. Not only will you know why we are recommending an account should be written off; but we will also bring to your attention any credit application or agreement flaws we see that could impact future debt collection recoveries in a specific province. Sometimes just a few simple updates can increase a client’s recovery percentages dramatically. We will be working with you as a source of business intelligence. Our PCR Innovation Project is collaborative in nature. We are open to innovative strategic alliances and pursuing a "2 way street" strategy in client relations. Successful business partnerships are mutually beneficial and there are ways we can add value to our relationship without either of us incurring any out of pocket costs. The rule of thumb is that the more traffic your web site pulls in, the more money you make. A simple thing like mutual backlinks helps both of us and can be as simple as a few lines of code. PCR is very proud of our robust I.T. infrastructure, high caliber support staff AND a wide arsenal of technology to improve recoveries. Got a problem or need in mind? Let’s talk. Our Vice President of Business Development has a unique combination of extensive I.T. and database experience combined with 20 years of commercial collection operations experience. When you need answers to receivable operations problems that may require technology or an innovative solution, give him a call or email. We have gone back to the basics - stay tuned for more innovation. Has Your Credit Dept. Gone South...Literally? With the weakening of the U.S. dollar compared to other world currencies, jobs that were once performed by the Canadian divisions of American firms are now being repatriated - including the credit underwriting and accounts receivable management functions. More American owned companies than ever before are moving jobs back to the United States. Wage costs and raw materials are now less expensive in some U.S. states than compared to Canada or Europe. This natural flow of jobs and capital will create opportunities for nimble risk management firms. Procedures for credit underwriting, performing credit checks, accounts receivable management, and cash posting will become challenging for firms as they attempt to bring these functions back in-house. An area of considerable risk for American creditors is the recovery of slow-paying Canadian accounts. 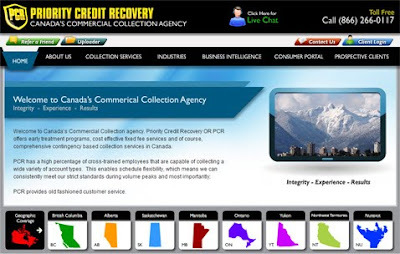 American firms are hiring U.S. debt collection agencies to recover their Canadian accounts; however very few U.S. agencies are doing it legally. More information may be found at www.collectdebtincanada.com. When doing business in a foreign jurisdiction, it may make sense to retain the services of an in-country specialist to leverage their knowledge and local expertise to maximize your chances of success. This is known as Knowledge Process Outsourcing, or KPO. If you are the Canadian manager of an American owned business or the CFO of a U.S. firm trying to better manage costs and risk; it may make sense to use a company like Credit Process Advisors Inc. to help achieve your cash flow and receivable goals. Knowledge Process Outsourcing, or KPO, can provide cost savings and process efficiencies and allow companies to focus on increasing revenue growth. KPO can also provide challenging and progressive positions for employees that want to move into supervisory and monitoring roles. The probability of failure is high due to the risks involved so a structured approach and program management should be used to execute this type of strategy. Organizations will succeed if the KPO strategy is used augment their services and performance, and not just to cut costs. With offices in Canada and the United States, Credit Process Advisors Inc. (CPA) outsources credit management resources to financial executives who want to focus on their core business. CPA's professional knowledge, business systems, qualified staff and external vendor management practices combine to provide our clients with risk mitigation and qualified credit management services. During a recent layover on my way to Detroit, I had the pleasure of speaking with a local businessman. The conversation got around to our respective employment and when he learned about our firms services; the conversation became much more animated. With the pain of the recent recession still fresh in his mind he said, "I wish I knew you 16 months ago! I would have paid you $10...NO $20,000! to have avoided some of the problems I had". This entrepreneur partnered with another fellow in a joint venture to provide services to the oil and gas industry. During the initial stages of the relationship; things were moving quickly and the deal came together fast. Unfortunately this fellow didn't thoroughly perform his due diligence on his new business partner. Turns out the new business partner had a somewhat shady past and his record for running profitable businesses was less than perfect. My new airport friend had committed over $250,000.00 to the joint venture which ultimately failed. "If I knew then what I know now, I never would have done the deal", he lamented. Completion of a comprehensive background is no longer the exclusive domain of professional credit managers. Obtaining business intelligence on potential suppliers, customers, and business partners is central to the decision-making process. We recommend interviewing key suppliers, talking with their customers, and in some cases getting a physical inspection done, to validate the information your potential business partner has told you about himself. Spending time and resources before doing a deal may seem like another unnecessary expense; however when considering the size of your potential investment - it may be the cheapest insurance you ever purchased. Priority Credit Recovery Inc. provides business intelligence services as part of our suite of services. Click here to learn more.